We present a temperature and a magnetic-field surface map of the K2 subgiant of the active binary II Peg. 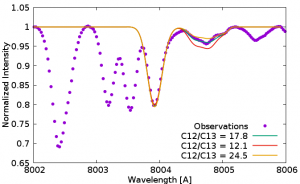 Employed are high resolution Stokes IV spectra obtained with the new Potsdam Echelle Polarimetric and Spectroscopic Instrument (PEPSI) at the Large Binocular Telescope (LBT). Our main result is that the temperature features on II Peg closely correlate with its magnetic field topology. We find a warm spot (350K warmer with respect to the effective temperature) of positive polarity and radial field density of 1.1 kG coexisting with a cool spot (780K cooler) of negative polarity of 2 kG. Temperature map from four different viewing angles. Magnetic field map from four different viewing angles. The 33 meters long (in A0 format) spectrum of epsilon Eridani is available for download. See the Wallposters section among the Library links. Note that the whole spectrum is in two PDF files, each having a size of almost 18 MB. The new measure of the carbon 12C/13C isotope ratio of the primary component of Capella, 17.8 ± 1.9, using high-resolution R ≈ 250 000 spectra obtained with PEPSI at both the Vatican Advanced Technology Telescope (VATT) and the Large Binocular Telescope (LBT) is significantly lower than the previous value of 27 ± 4 but now agrees better with the recent model prediction of 18.8-20.7. 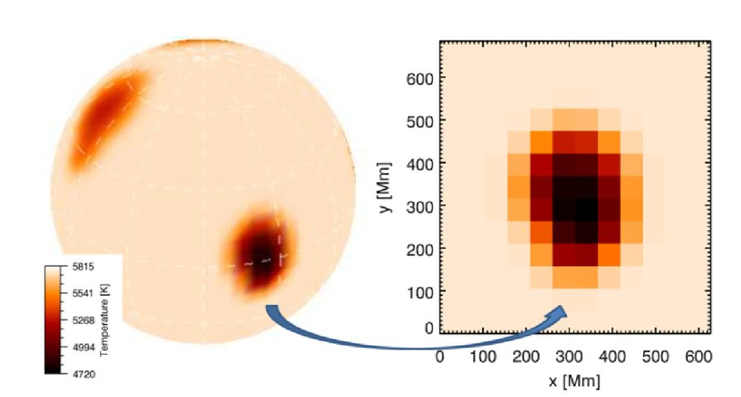 The first temperature surface map of EK Dra from very-high-resolution spectra obtained with the Potsdam Echelle Polarimetric and Spectroscopic Instrument (PEPSI) at the Large Binocular Telescope shows four cool spots. The temperature morphology of one of them appears to show so far the best evidence for the existence of a solar-like penumbra for a starspot. Left: Temperature Doppler image of EK Draconis. Right: iMap reconstruction of the spot that indicates evidence for penumbra.